1. Dallas Goedert is alive. His arm didn't fall off. His future in football isn't in jeopardy. The rookie tight end left Saturday's practice early and there was some panic in the Eagles Twitterverse. Someone, possibly a fan in attendance during the open session at the Linc, wrote that he broke his arm, and the social media vacuum picked it up and spun it into minor hysteria. The Eagles weren't updating his condition afterward, but I was told that it was nothing of significance and left it at that. The anxiety was mildly understandable. Goedert had an impressive preseason debut and it's clear, as it's been since the spring, that he will have a vital role on offense. But all is well. Remain calm. Goedert said he just dinged his elbow and expected to be back in a day or two. He watched most of Sunday's session. 2. The Eagles have been light at wide receiver for all of camp. Alshon Jeffery (shoulder) has yet to practice, and Mike Wallace, Nelson Agholor and Mack Hollins have spent time on the sideline. That's all four of the Eagles' top receivers. Wallace returned on Saturday and has had two solid practices in a row. Agholor joined the injured last week and is still out. He said the injury wasn't significant, but he was a spectator Sunday. Hollins missed his second straight workout. Markus Wheaton has also been on the shelf for about a week. And Shelton Gibson missed time with a concussion, although he has shined since his return. The second-year receiver has improved in a year – his 63-yard touchdown in Thursday's game was an obvious highlight – and he provided further evidence on Sunday. Gibson burned cornerback De'Vante Bausby on a deep "go" route during an early team drill, but quarterback Nate Sudfeld overshot him. He had some good repetitions during receiver-cornerback 1-1-1s in the red zone. There are some routes that the corners can't possibly be expected to stop in these drills, but on corner fades it's fair game. Gibson slipped corner Rasul Douglas and pulled the pass in with his fingertips. I have him clearly ahead of Wheaton for the fifth receiver spot. 3. Cornerback Jalen Mills is a must-watch during one on ones. He doesn't back down an inch. He clamped down receiver Kamar Aiken, who tried to break loose with a double move. The Eagles had officials on hand, and when Mills looked to the back judge to see if there was too much contact, he got the thumbs up. He broke up a short "out" to Bryce Treggs and when the receiver tried to pull in a pass over the top a few tosses later, Mills was on him like glue. Treggs pulled the pass in and claimed he got both feet in just as he came down. But Mills countered: "No, man, that's out." The official agreed. The third-year corner has had a strong camp. Mills may not have elite speed, freakish arm length, or cat-like feet, but he balls every chance he gets. 4. Avonte Maddox had his day in sun. The rookie corner took a few reps with the first-unit defense in the slot a day ago, but he was there full time Sunday. Defensive coordinator Jim Schwartz has been rotating almost all the corners inside, but Maddox was the first rookie to get an extended look with the starters and he delivered. Quarterback Nick Foles tried for receiver Greg Ward on a sideline route, but Maddox had him covered and the ball sailed wide. Mills and safety Rodney McLeod each gave the corner a chest thump. Maddox blitzed a few times off the edge as well, and forced a quick Foles toss to his "hot receiver." Rashard Davis wasn't ready and the ball hit the grass. Maddox rushed a fair amount in college. His cover technique was sound on several one-on-one reps. Receiver Anthony Mahoungou tried to use his size to his advantage on a fade – he has a seven-inch edge – but Maddox looked back, timed his swipe, and knocked the ball incomplete. "I like that," defensive backs coach Cory Undlin said. "He's trending up," Schwartz said after practice. Bausby hasn't separated himself as much as he did in the spring. He's been solid, and is almost guaranteed a roster spot, but I don't think he makes one of the Eagles' top receivers expendable if a trade arises. Cornerbacks get hurt. They're prone to soft tissue injuries during the season. You can't have enough. Doug Pederson gathers his team at the NovaCare Complex on Sunday. 5. Josh Adams took some early team reps with the second team offense. The Eagles rotate a lot at running back, but he has been getting more opportunities with the first two units. One sign that he may have jumped guys like Donnel Pumphrey, Wendell Smallwood and Matt Jones on the depth chart was his presence on the first-unit punt cover team. Pumphrey missed another practice with a lower body injury. He has time to impress the coaches, but he can't spend more time in the tub if he wants to make the club. Smallwood ripped off a few nice runs, but he also couldn't hang onto a swing pass. 6. Haloti Ngata has had a quiet camp, which is understandable for a 34-year-old defensive tackle at this stage in his career. He's taken a few days off here and there, and only occasionally engages in team drills. He jumped in for a rare one-on-one versus center Jason Kelce, who anchored well. Just when I was getting used to praising Taylor Hart, he had a few shaky turns, once getting fooled by a Michael Bennett swim move. Tackle/project Jordan Mailata kept defensive end Danny Ezechukwu from getting penetration on two rushes. His technique isn't there by a long shot, but he can overpower smallish ends. Defensive tackle Aziz Shittu used a bull rush to get by guard Chance Warmack, but later tweaked his arm and had to step out. Center Isaac Seumalo spent a second straight day as the 7-on-7 "Snap Boy." 7. 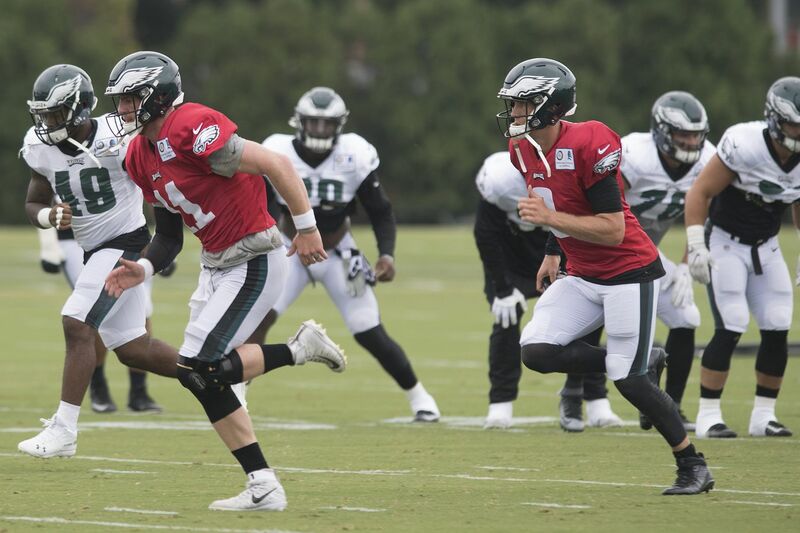 A running diary of team drills, so to speak, starting with the first unit: Foles hit tight end Zach Ertz in the soft spot of a zone between safety Malcolm Jenkins and Maddox. Wallace skied for a ball on a deep dig route and came down aces. Great catch. He popped up and celebrated with an exaggerated first down motion. Foles tried to hit Ward on a deep post, but he threw into double coverage and Jenkins had himself an interception. Kelce, channeling his inner Seumalo, snapped low to Foles and the ball was whistled dead. Bennett worked almost exclusively inside at defensive tackle. Darby deflected an errant pass right to linebacker Nigel Bradham. Defensive tackle Fletcher Cox was down briefly and slow to get up, but walked off and later returned. Mills sacked Foles on a corner blitz. Bennett penetrated and "tackled" running back Jay Ajayi for a loss. Ertz caught a touchdown. Darby leaped for an interception and landed on his back. He laid motionless for a spell as trainers ran to his assistance, but he later got up and walked off. 8. Second team: Douglas, who has had an up-and-down week, led with his shoulder and dropped Treggs after a short grab. Sudfeld hit tight end Richard Rodgers in stride with a beauty seam pass. Safety Jeremy Reaves had Rodgers out of the slot and lost him on a double move, even after he bodied up to the tight end off the line. Sudfeld threw elsewhere. Sidney Jones dove and broke up a short sideline pass. 9. The third unit: Corner D.J. Killings was credited with a sack on a delayed blitz. Quarterback Joe Callahan strung a rope to tight end Billy Brown. Linebacker Corey Nelson, who's had a quiet camp, touched Callahan down in the backfield. 10. And a few leftovers … Carson Wentz again didn't participate in team drills, but he did everything else, including 7 on 7s. Record. Scratch. Skip. … Center Ian Park and linebacker Asantay Brown didn't practice again. They're undrafted rookies.